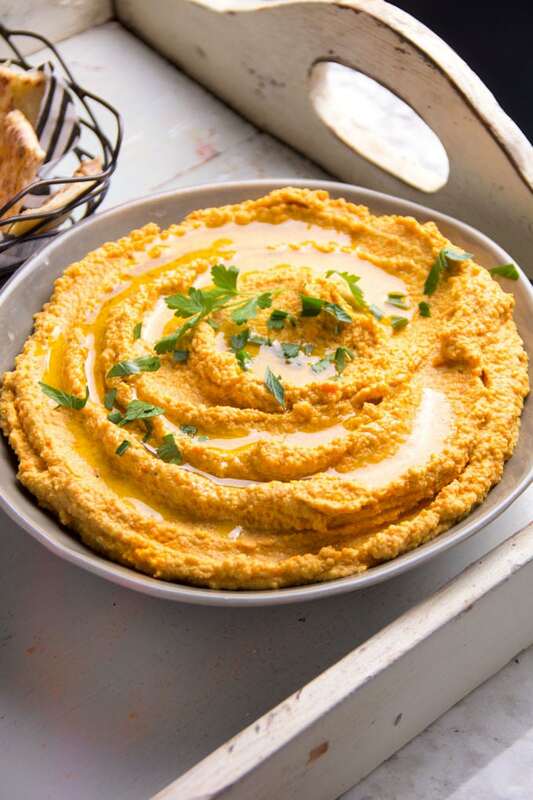 Here’s my new favorite appetizer: chipotle carrot hummus. I’ve been making it for every occasion lately. The carrots are cooked just long enough to bring out their natural sweetness. Then they’re blended with chickpeas, garlic, tahini, lemon and chipotle chile powder, which adds a delicious smoky kick. This super healthy hummus takes just 15 minutes to make. I packed our winter coats and boots into the storage closet this past weekend. Spring has sprung in a big way here in New England. There are little buds on all the trees. Hyacinths are in full bloom. The two briskets I cooked for Passover might be the last braising action my ovens will see for a while. I feel that change of seasons, change of cravings thing that happens every year around this time. 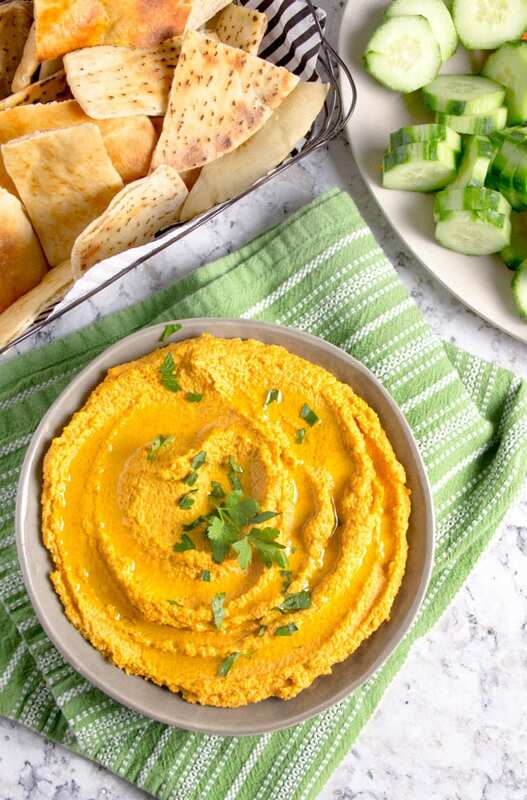 This time it led me to make this beautiful, orange, bright and healthy carrot hummus. It’s my new favorite appetizer of the season. I have a thing for appetizers and hors d’oeuvres. Part of it is that I want to stretch out the dining experience for as long as possible. I especially love the first hour or so of a get-together. It’s always an exciting time, abuzz with greetings, everyone happy to reconnect and catch up on each other’s lives while sipping wine or a cocktail and nibbling on something delicious. 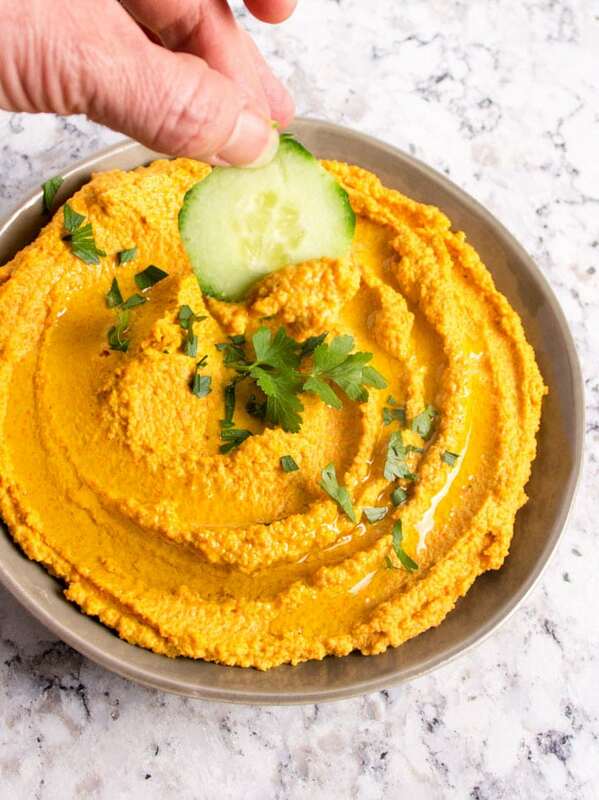 This carrot hummus is the perfect nibble because it makes everyone happy but it’s light enough to leave them still hungry for dinner. Peel and slice the carrots and the garlic. Sauté the carrots in olive oil for a few minutes. Add the garlic to the pot and cook for another minute. 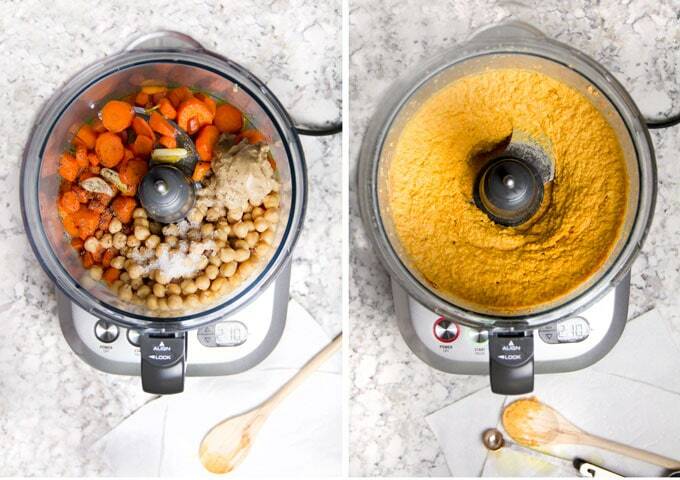 Transfer carrots and garlic to your food processor. Add chickpeas, tahini, lemon juice, water, salt, chipotle and olive oil. Puree. I like to serve carrot hummus in a shallow bowl. I use the back of a spoon to make swirls in the hummus. I love the way that looks with oil drizzled over it. It also tastes great, especially if you use good quality olive oil for the drizzling. Sprinkle hummus with parsley or save a half dozen chickpeas from the can to add as a garnish. I have two other delicious homemade hummus recipes on Panning The Globe. 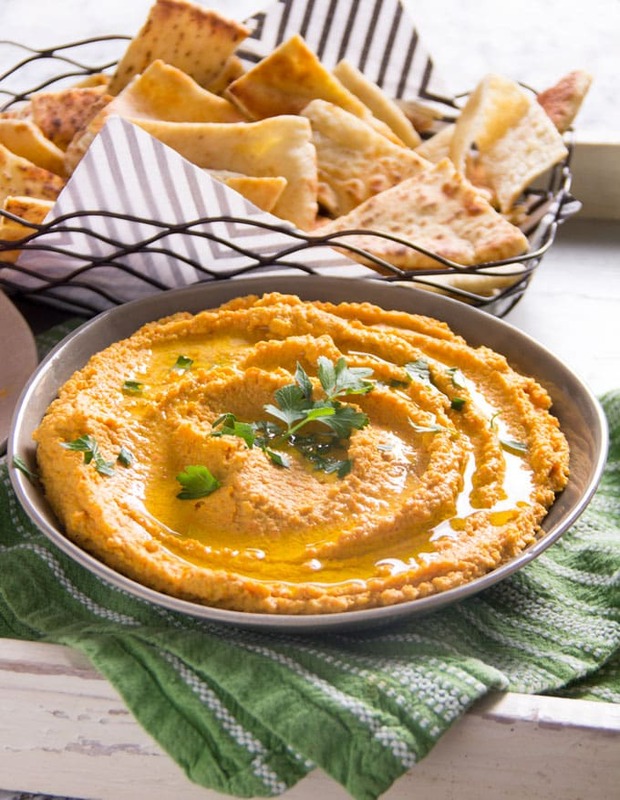 One is my favorite classic chickpea hummus recipe. Simple to make and way better than any store-bought hummus. The other is a dish I fell in love with on a trip to Istanbul, Turkish hot layered hummus. It has a touch of the exotic, and it’s always a crowd pleaser. 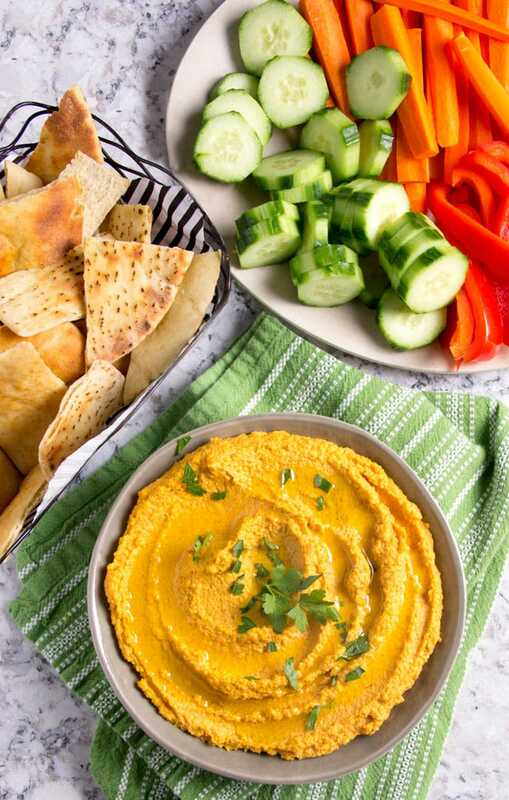 Here’s the recipe for Chipotle Carrot Hummus. I can’t wait for you to try it. Make sure you have lots of good things to dip because, if you’re like me, you won’t be able to stop. If you make it, I hope you’ll come back to leave a review and let me know what you think! 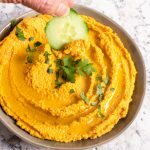 Delicious healthy hummus with sweet carrots and spicy chipotle chile powder, a perfect dip for raw veggies, chips or pita. Heat 2 tablespoons of olive oil, over medium heat, in a heavy saucepan. 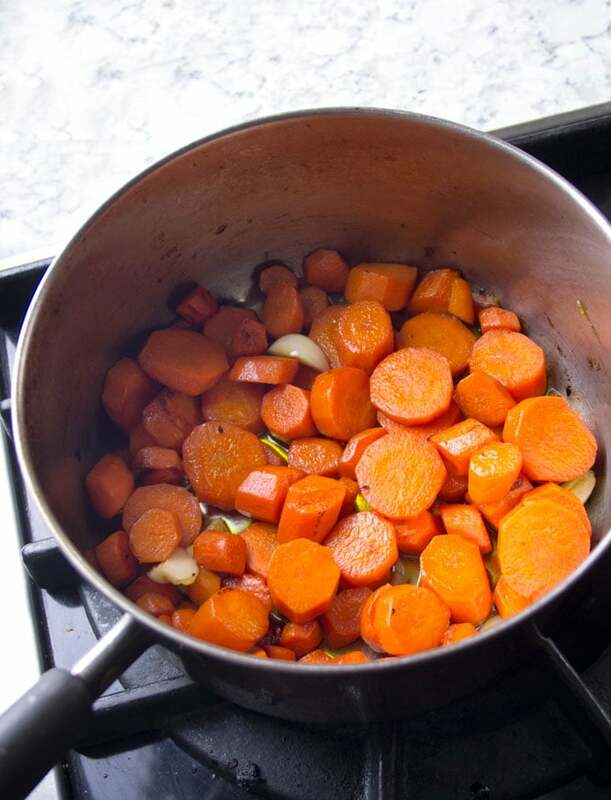 Cook the carrots, stirring often, for6- 7 minutes, until slightly softened and starting to brown just a bit. Turn the heat down if the carrots are browning too fast. Toss in the garlic and cook, stirring, for another minute. Transfer carrots, garlic and whatever oil is in the pan, to the bowl of a food processor. Add chickpeas, tahini, lemon juice, water, salt and chipotle. Puree to a creamy consistency but don’t over process. Add the remaining 2 tablespoons of olive oil and whiz for a few seconds to combine. Taste and correct seasoning with additional salt, if you like. To Toast and Prepare Pita so it’s perfect for Dipping: Preheat the oven to Broil. Lay 4 6-inch pitas out on a jellyroll pan. Brush a light layer of olive oil over both sides of each pita. Set the pan in the oven for 3 minutes or so, watching carefully to prevent burning. As soon as the pitas start to brown, remove them from the oven. When cool, slice them into 1 1/2-inch strips using a pizza cutter. Cut strips in half crosswise. I didn’t know hummus could be improved, but it can! This recipe really hit the spot when I was in a crackers and dip mood the other night. I’m shocked to see I’m the first comment on such an incredible recipe. This is delicious and is now my go to way of making hummus. I like to put a little extra chili pepper in but I like spicy. Every one of my friends who’s eaten this asked me for the recipe.